White Beans and Black Olives with Tuna - can we all get along? Of course so, when The 99 Cent Chef brings them together as a delicious bean salad. 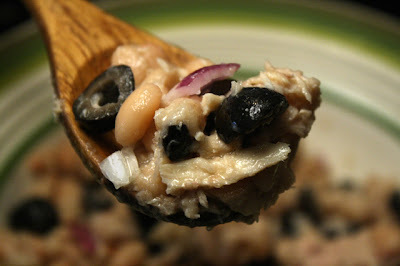 It's a hardy serving with earthy black olives, tender beans and pungent chunks of tuna. I also add some red onion for crunch and sweet heat. And, I drizzle on good olive oil for richness, and some vinegar for a tangy finish. 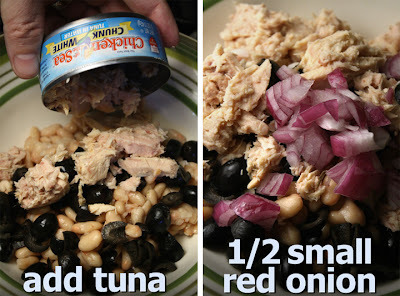 Beans, black olives and canned tuna are dollar store staples, so you know this tightwad recipe is right up the chintzy chef's alley. And, I'm happy to share this delicious budget recipe with everyone. My cupboard tinned treat requires some minimal assembly, but no cooking. Serve as a side, or load on an extra scoop or two, and it's an entree. 1 small can (5 ounces) tuna - in oil or water. Canned tuna or from a pouch. 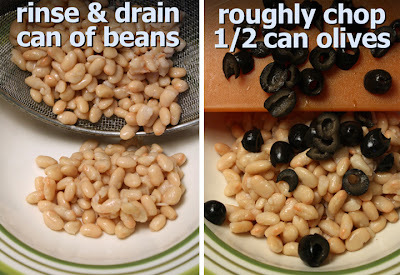 1 small can (15 ounces) of white beans - drain and rinse. Okay to use any favorite canned whole bean. 1/2 can of black olives - drain and roughly chop. Okay to use pre-sliced. 1/2 small red onion - chopped. Okay to use white or yellow instead. 2 tablespoons olive oil - or any tasty oil. Skip oil if you use canned tuna in oil. 1 tablespoon vinegar - white, rice, balsamic, or any you have on hand. Can also use lemon or lime juice. 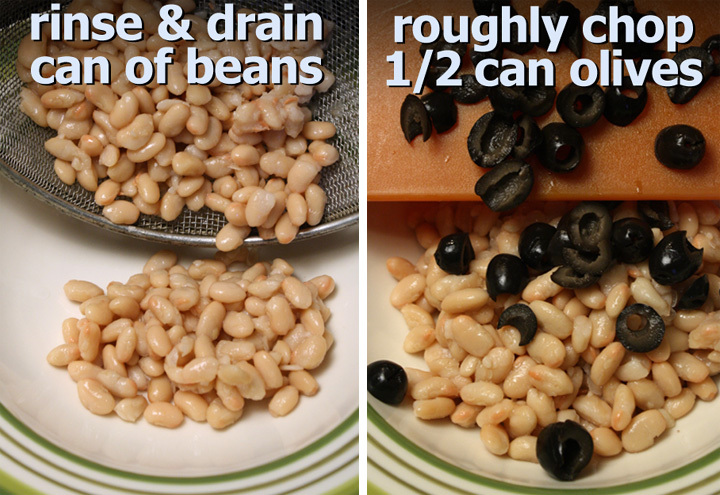 Drain beans and rinse off any sauce. Roughly chop 1/2 can of drained whole black olives (okay to use pre-chopped 1/2 can of olives.) Chop 1/2 of a small red onion. 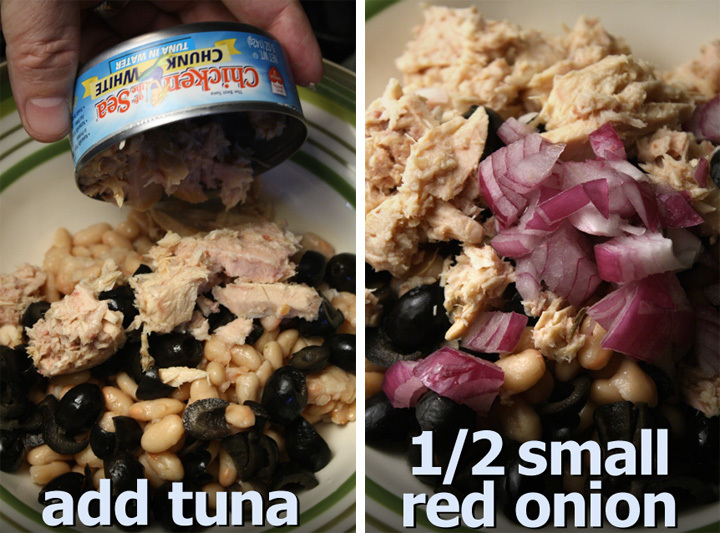 Into a medium bowl add beans, olives and red onion, and mix. Salt and pepper to taste. Mix in 2 tablespoons of olive oil and one tablespoon of vinegar. Add a can of drained tuna. 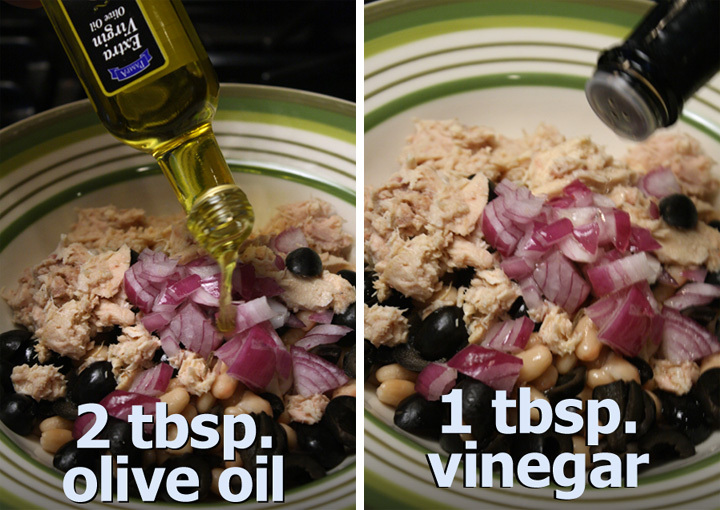 If tuna is in oil, then add the oil, too (you can leave out the 2 tablespoons of oil mentioned above.) 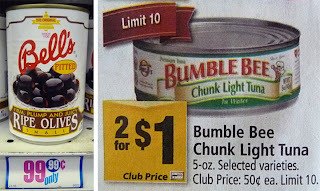 Lightly mix until tuna is incorporated - I like to leave the tuna chunky. Serve chilled or at room temperature. The Chintzy Chef hatches a delicious breakfast scramble that will please his Kosher abiding visitors. Jewish Scrambled Eggs are a riff on a favorite of mine: lox with cream cheese. 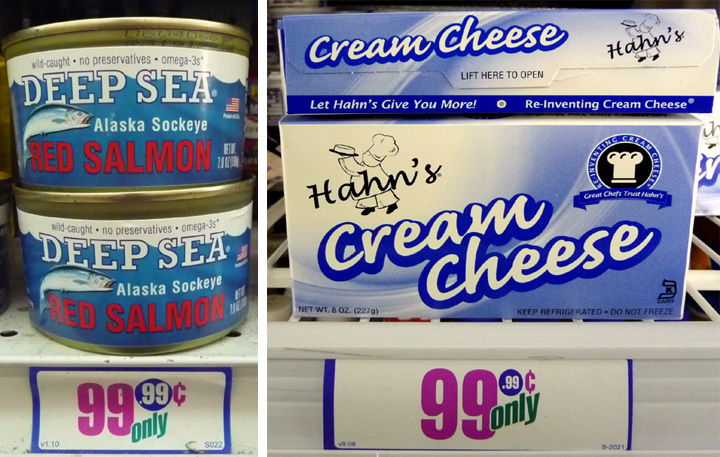 The main ingredients are cheaply bought canned salmon, cream cheese and eggs. 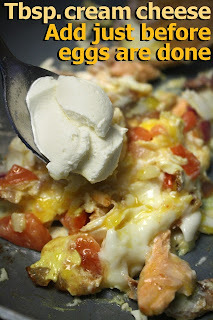 And since I am a miser, it is the perfect breakfast budget recipe! 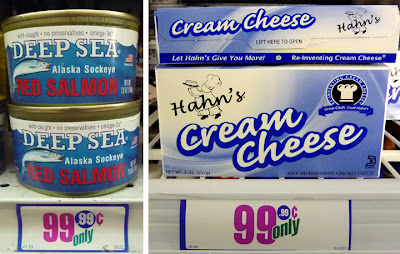 I always find cans of cooked salmon at my local 99c only Store. Of all the cheeses out there, cream cheese is one of the cheapest. Eggs are inexpensive, and my other budget ingredients are red onion and tomato. It's quick to do: just saute the salmon, onion, and tomato for a few minutes, then blend in your favorite egg scramble. And finish up with a dollop of cream cheese. It's a hearty way to start your day, but still lighter than a typical breakfast of eggs, bacon, hash browns and toast. For my Jewish friends, make sure to open eggs in separate bowls, in case any have a spot of blood in the yoke, thus rendering them non-kosher! And if you like bagels in the morning, then my Jewish Scramble Eggs goes great between two split and toasted slices. 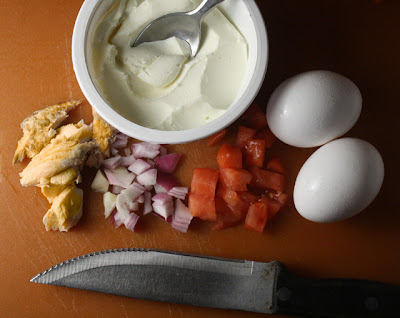 And, click on the following recipes for more lox and cream cheese 99 Cent Chef creations: The Loxaco Video and A Salmon Schmear. 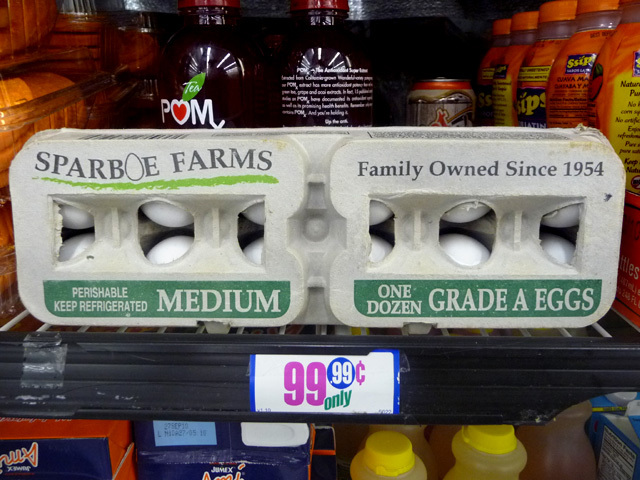 2 - 3 eggs, depending on egg size. 1 tablespoon of salmon - or a few chunks. I used canned, but if you have fresh, use it. 1 tablespoon red onion chopped - okay to use white or yellow onion. Add teaspoon of oil over medium heat in your favorite omelet pan. Add chopped onion, tomato and salmon. I like to taste chunks of salmon, so stir gently for about 2 minutes, until onion is soft and everything is heated through. 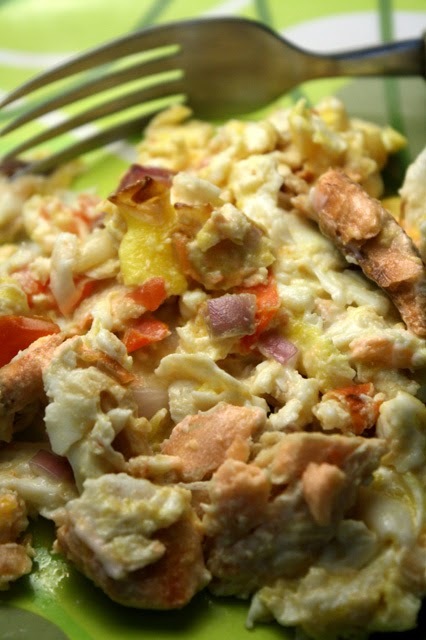 Prepare eggs for scrambling your favorite way. Do you like a little milk whisked into your eggs? Or do you beat the eggs first? Or, God forbid, do you use an egg substitute? Hey, do it your way. I like to crack open eggs right into the pan, and do a sloppy scramble -- I like to see, and taste, the difference between white albumen and yellow vitellus. 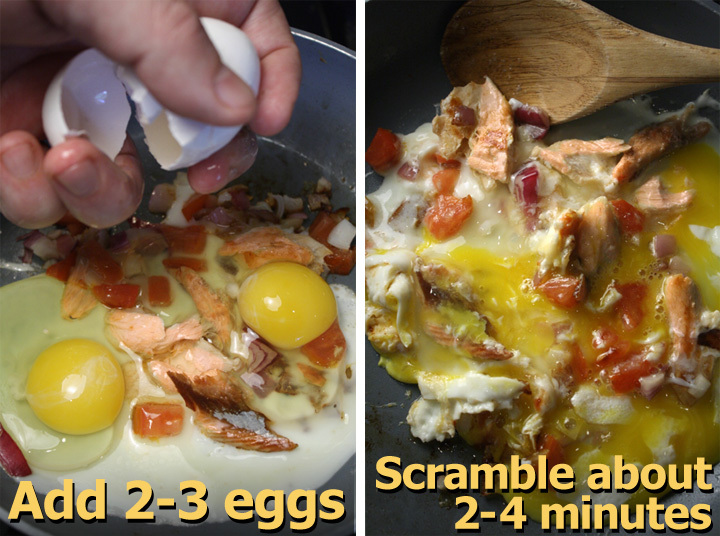 Cook and scramble eggs until almost firm, about 2 - 4 minutes. Just before done (with a few wet spots,) add tablespoon of cream cheese. Blend all together for a minute or until cheese is melted. Serve with your favorite accompaniment, or toast a bagel and make a Kosher Breakfast Sandwich! You can experiment with adding, or subtracting, the amounts of cream cheese and salmon. Some may like it less fishy -- although, I think salmon is mild tasting. How cheesy do you want your eggs? You may want to add twice as much as I do. Same goes for onion and tomato; don't worry about exact measurements, it will still be scrumptious. Also, this recipe is easy to expand for more servings, just double everything for a guest. And if you have any leftover flakes of salmon it's freezable; so you can make my Jewish Scrambled Eggs any morning. My vegetarian visitors will like the latest lush dish from the skinflint epicurean. You now have a perfect recipe excuse to eat more cauliflower. 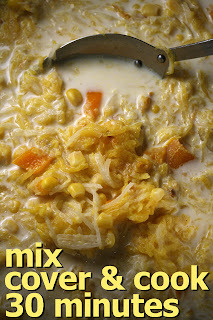 Especially cauliflower florets stuck in a yellow tar pit of bubbling mozzarella and cheddar. 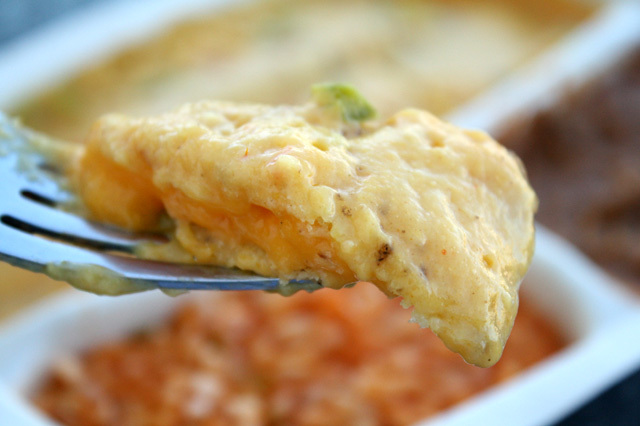 And melted cheese makes everything palatable - even a picky tot will scarf it down! Plus, adding some cheap pasta turns this entree into one filling meal. 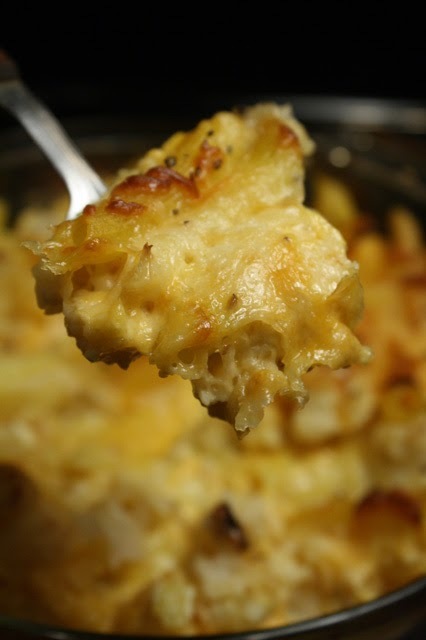 If you like fresh baked Mac and Cheese (I have a delicious 3 cheese one - click here,) then you will dig into my Baked Cauliflower with Pasta and Cheese. This is a perfect one-pot meal for the family. I used cream and regular cheese, but you could lighten it up with 2% milk and low fat cottage cheese. You can also bake with wheat, whole grain or gluten-free pasta. 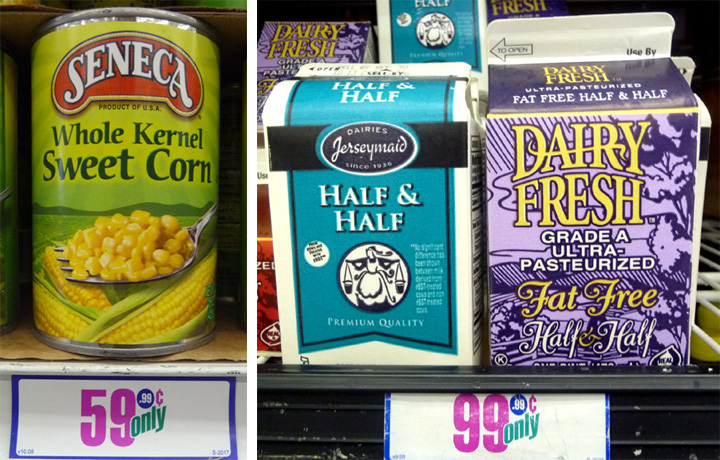 Milk, cauliflower (or frozen florets) and pasta are often priced cheaply from a regular grocery store, too. 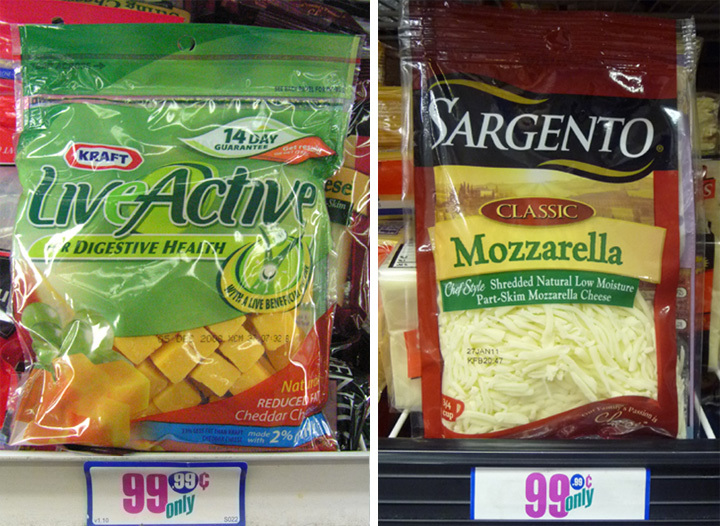 I bought an 8-ounce bag of cubed cheddar cheese and a 3-ounce package of shredded mozzarella at my local 99c only Store. Anytime I see cheese on sale I get a few packages to freeze -- if you are going to melt it, then you can freeze it. Most any cheese on sale can be used in this recipe. The recipe preparations are quick. Cook some pasta, and remove the florets from the cauliflower. The cheese I got on sale was already cubed or shredded (no need to shred cheese, if you don't want to, cubed or sliced is good enough.) And once your casserole dish is in the oven, that's it -- just chill out for 45 minutes until it's done. Oh, you do have to open the oven once, and take the casserole top off during the last 15 minutes, so the cheese browns a little. 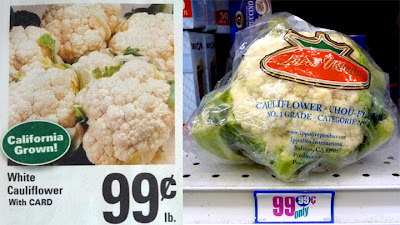 Pasta and cauliflower go well together, especially in The 99 Cent Chef's latest creamy concoction. Play it here, video runs 2 minutes, 14 seconds. 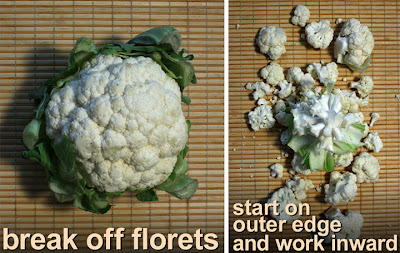 *1 whole cauliflower - break off florets. Okay to keep green and white leaves (as long as they are not wilted or too old.) In my video I left out the green and white leaves. *11 ounces of cheese total. I used an 8 ounce package of low fat Mild Cheddar (2 cups cubed) and 3 ounces shredded Mozzarella (about 1/2 cup.) Fresh shaved, or cheap grated Parmesan would be a flavorful addition. *You can add, or subtract, as much cheese as you like. Or a medium carton (about 15 ounces) of low-fat Cottage Cheese is lighter substitution. 1 1/2 cups of milk - okay to use low fat or regular. In the video I show a cup, but would actually use 1 1/2 cups, when I make it again. 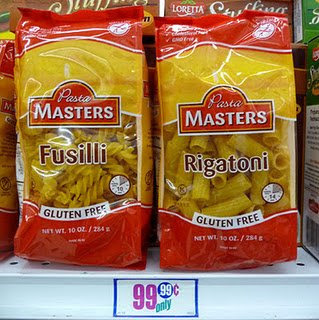 Half a package of pasta - any type really. I used about 8 ounces of Penne. Bowtie, spirals, shell, macaroni, even spaghetti (break in half,) would be fine. 1 teaspoon of cornstarch or flour. *I've seen packages of frozen cauliflower florets, which you could conveniently use. Cook pasta about half the recommended cooking time. You will finish cooking in the oven. Drain and set aside. 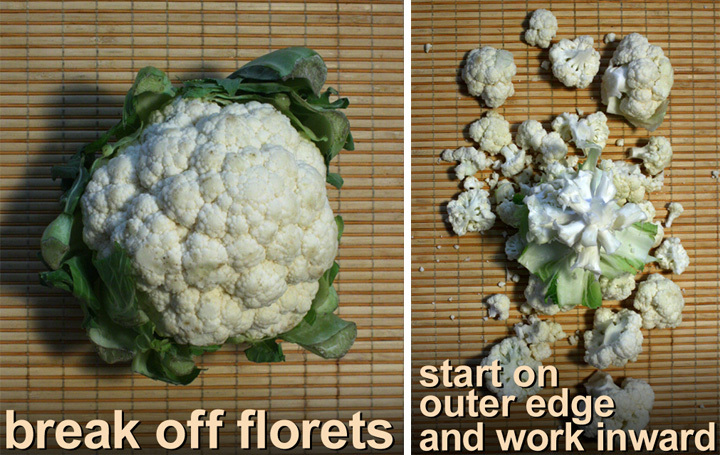 Break down whole cauliflower by just snapping (or slicing) off the florets. Work from the outside of cauliflower and move inward. You can halve the largest florets, if you want. Set aside. Add half or the pasta, cauliflower and cheese (save 1/2 cup Mozzarella and/or Parmesan as a topping.) Mix, then add the rest. Season with salt and pepper (not too much salt, as cheese has plenty.) Mix again and top with a layer of Mozzarella and/or Parmesan cheese. Just to be safe, make sure that the milk and cream does not reach the top lip of your baking dish -- leave an inch from the top, pasta may expand a little. You could put a baking pan underneath in case any liquid bubbles out. Cover and bake at 350 degrees for 30 minutes. 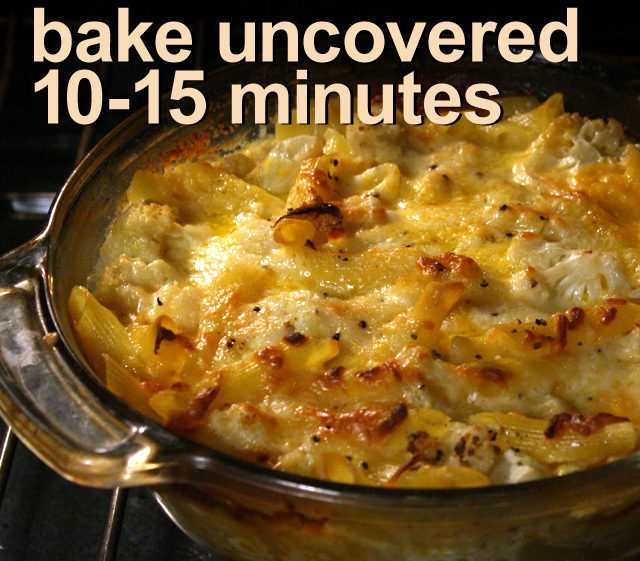 To finish, just remove cover and allow cheese to lightly brown for about 10 -15 minutes. And save the best part of any pasta and cheese bake - the socarraet (burnt rice on the bottom of a Spanish paella,) which is, crispy caramelized pasta and cheese that's scraped from the bottom of the casserole dish! 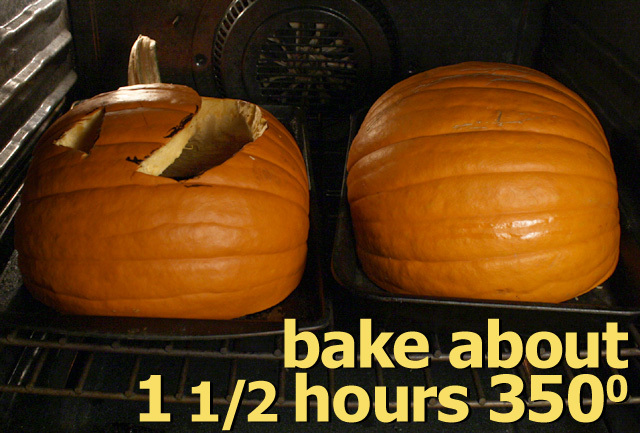 First, I would cut down on the baking time by 10 minutes. The pasta and cauliflower were a little mushy, but still delicious -- this is a personal preference. My recipe ingredients are easy to double to feed many more -- you just need a big enough pot (or two) with a cover (or foil.) You could also stretch the recipe by adding a whole package of pasta; just make sure to add an extra cup of milk, because pasta soaks up any liquid. For more color, you could make this dish with broccoli, or add some to the cauliflower. Even chunky slices of carrot sweeten in this creamy concoction. I left out the cauliflower leaves and stems. Next time I would use them both-- chopping up the stem into bite-sized pieces. 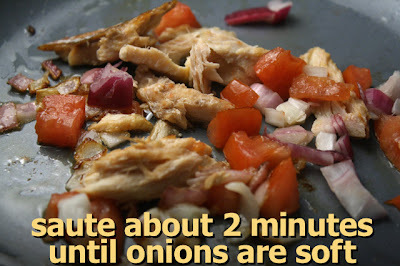 I would also add a sauteed small chopped onion with a tablespoon of garlic. For my non-vegetarian visitors, add some crisped crumbled cooked bacon (or a package of bacon bits,) chopped ham, or even sauteed ground beef, chicken or turkey, for more heft. You could also mix in some shredded leftover chicken, or a small can of chicken. 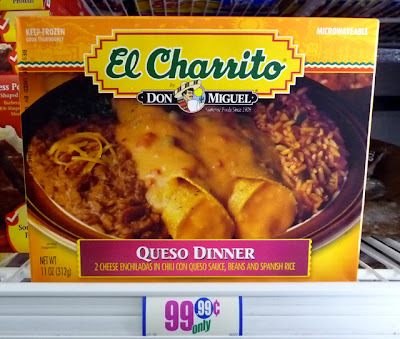 Loaded with cheese, these 2 stuffed enchiladas, with beans and rice, from El Charrito, are well worth 99.99 cents. If you saw my last disappointing Deal of the Day review (click here), I'm pleased to point out this micowaveable dinner has a lot going for it. This is not a problem with El Charritos' Cheese Enchilada Dinner. 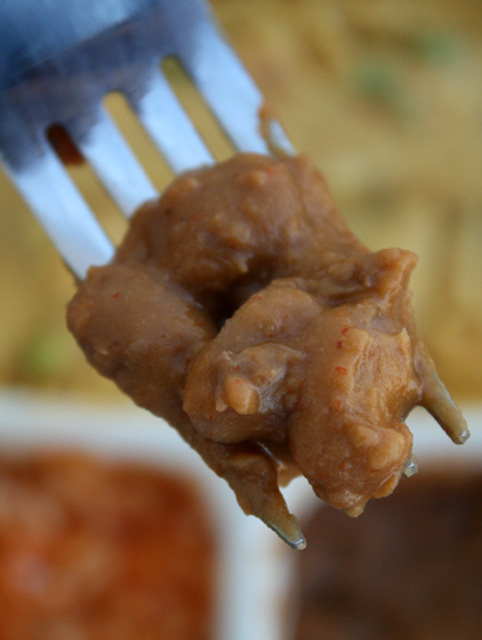 The refried beans have enough whole pinto beans for texture. The Mexican Rice is slightly soggy, but much better than Banquets. 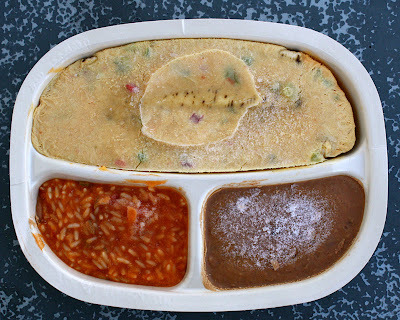 And the main ingredient, the cheese enchiladas, are sprinkled with small pieces of green and red chiles, that give off a slight tingle of chile heat after each bite. It takes real guts to make mass produced Mexican food spicy. The only slight drawback is the cheese. While flavorful, it is not Mexican in any way -- more like cheddar flavored Cheez Wiz, made to appeal to average American tastes. But on the good side, these enchiladas are fat ones, so you get your moneys' worth. As with many cheap, frozen, Mexican meals they are loaded with ingredients, too many to read all the way through. So, this is something you don't want to eat too often. On a scale of 1-9, 9 being best, I give El Charritos' Queso Dinner a solid 7 ! I deducted a couple of points for way too many chemicals and average tasting cheese. 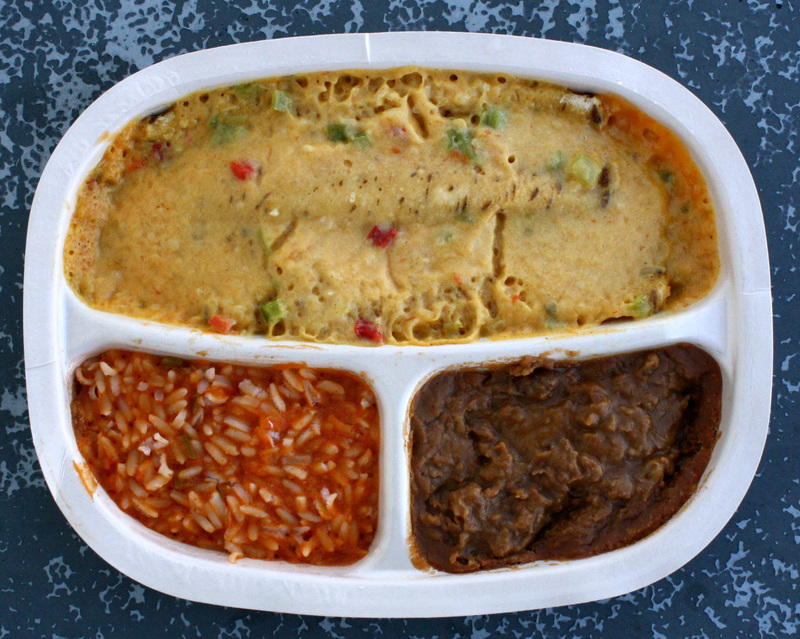 But it is definitely a step up from my usual Banquet frozen Mexican dinners. Now, I could take off a point for false advertising, but I won't -- just compare the package photo at the top of this post and the microwaved plate in photo above! There is no stringy cheese on the beans, and the enchiladas are unrecognizable (and less visually appetizing) under a layer of cheese sauce. Click on image and begin to read the ingredient list! The clocks have been set back an hour, it's raining outside in Los Angeles this morning, and I'm in the mood for a hearty soup. 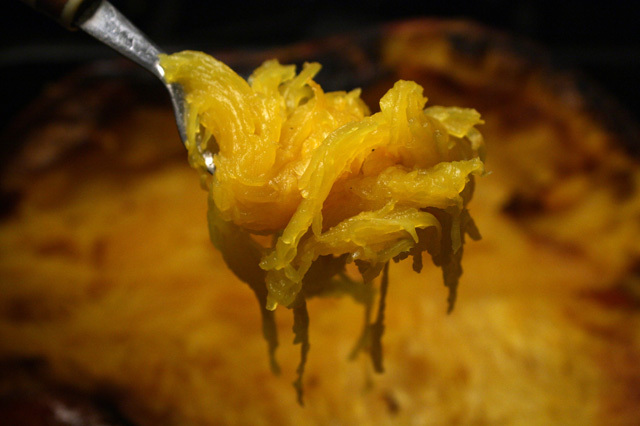 A couple of days after Halloween I scraped off the melted wax from inside our pumpkin, and roasted the split halves in a 350 degree oven for an hour and a half. I'll put the sweetly caramelized, soft orange flesh to good use today. 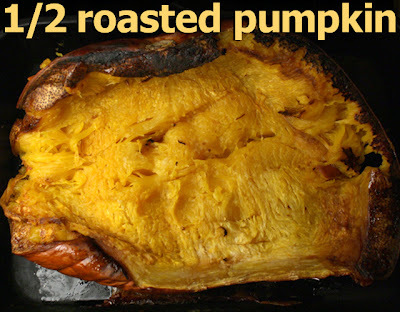 When Amy bought the pumpkin I knew I would cook something with it, since baked pumpkin is a delicious main ingredient I can use in many recipes. The next step was figuring out what to cook with it - and four days later, I did! My Rustic Pumpkin and Corn Chowder is easy to put together. 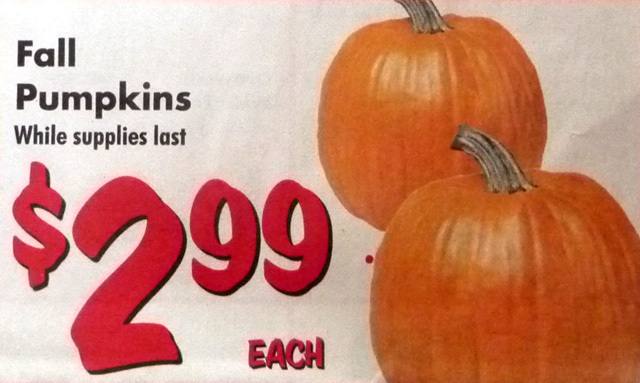 And, of course, all the ingredients are cheap (especially, since grocery stores are practically giving away pumpkins this time of year.) 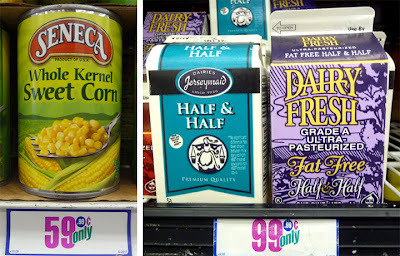 The other ingredients are broth, half and half cream (or milk,) a can of corn, onion, garlic and bell pepper. Pretty simple, but complex in flavor. Way below 99 cents per pound! 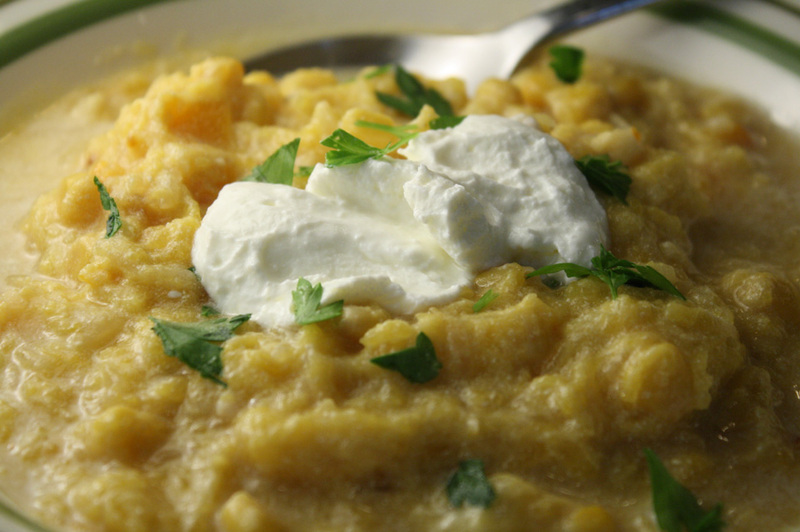 The roasted pumpkin will break apart while cooking in a bath of stock and cream, so there is no need to blend it to mush - as most recipes tell you - hence, my calling this vegetable chowder "rustic." It's a great and comfy dish that will feed your whole family. I hope you saved your pumpkin like I did. So, just cut out the soft and moldy bits and get cooking! And, if you still have leftover pumpkin after making this recipe, I have a Pumpkin alla Fusilli entree you can try out by clicking here. 5 cups of cooked pumpkin - you can use more, just add another cup or two of milk, broth or water. 1 can of corn with liquid - okay to use 2 cups of fresh or frozen corn kernels. 1 whole medium onion - I used a small red, and a small white onion, chopped. 1/4 bell pepper - optional. I used a red bell pepper. 1 tablespoon garlic - chopped fresh or from jar. 2 cups half and half cream - okay to use milk. 2 cups of broth (veggie or chicken) - I used a 14 ounce can of chicken broth. 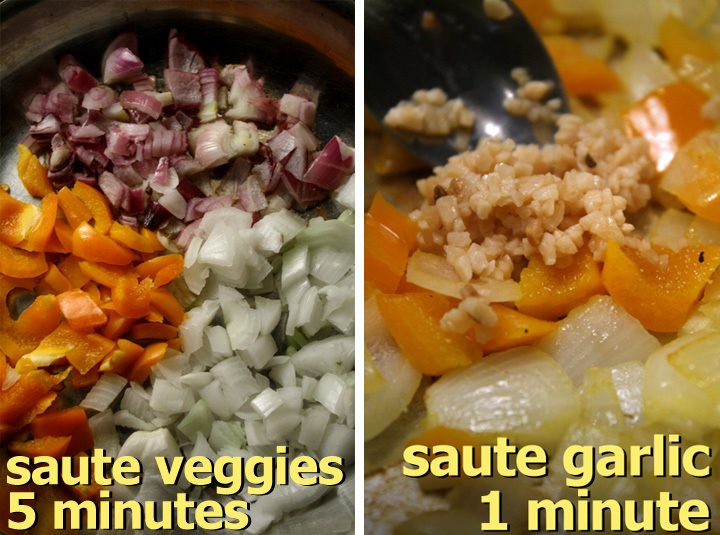 You can dissolve a couple of bouillon cubes in 2 cups of water instead. Split pumpkin in half and scrape out the seeds. Place in a 350 degree oven on a large cookie sheet (s). 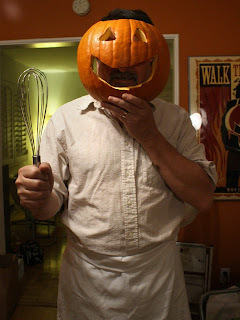 Make sure the pumpkin is cut side down - so it looks like a dome - it will steam and soften, without drying out. If you have holes cut out like we did, then just cover it with foil. If your containers are small it's okay to cut pumpkin into large chunks and just cover with foil. In the photo above the eyes and mouth holes are uncovered, and what happened was that a dry skin formed over the pumpkin flesh. It was still soft underneath, but I had to peel it away. Roast pumpkin for about an hour and a half, depending how large the pumpkin is. Go ahead and check on it after an hour -- if the skin is soft to the touch of a spoon, and the flesh is easy to scoop out, then it's ready. Let the pieces set for about 5-10 minutes to cool down. 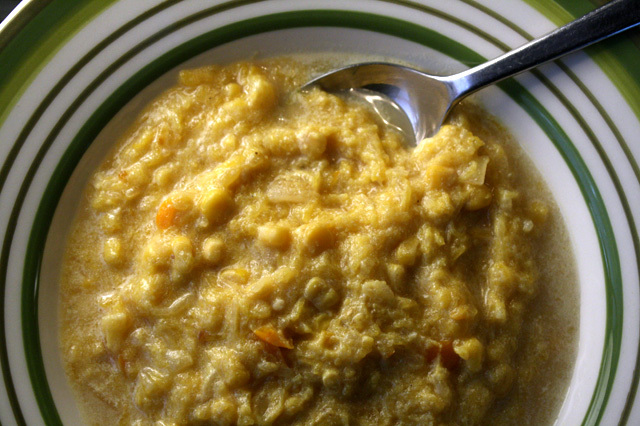 Scrape out the cooked pumpkin flesh with a large spoon (discard any skin that may come off with it), and place in a large stock pot for your chowder. Add canned corn (including liquid) and cooked veggies to the pumpkin in the large pot. 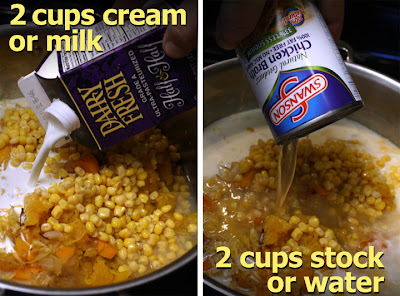 Pour in 2 cups of cream or milk, 2 cups of broth, and season with salt and pepper to taste. Stir together and bring up to a low simmer, immediately reduce heat to the lowest, and cook covered for about 30 minutes. You don't want to boil the chowder or the milk will scorch and separate. Stir the chowder after a few minutes of covered cooking. Check back on the chowder after 15 minutes to make sure liquid doesn't cook out, and add more if needed. I like my chowder thick, but if you want a soupy consistency, then add an extra cup, or two, of any of the listed liquids above. Soup is actually ready when hot, but I like to slow cook it for half an hour -- so all the flavors intensify, and the veggies soften even more. Get decadent and serve with a dollop of Creme Fraiche, Sour Cream or Mexican Crema, and a sprinkling of chopped parsley or chives. I didn't have any bacon on hand, so left it out; although a couple of crumbled browned slices, with the grease, would be a tasty addition. I would also add a cup of white wine next time. I like using mint. Just click on any of the following recipes to see how I've used it: Pollo en Mente , Strawberry Parfait , and a minty rum drink, the Mojito . Now you can add a luscious Italian entree: Green Peas, Mint and Salmon with Pasta. 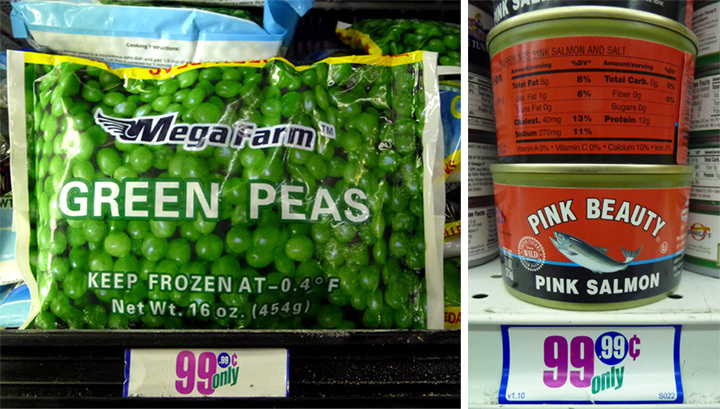 Fresh sprigs of mint and tender green peas go well together. I sweeten the peas even more by steaming them, from their frozen state, in a bath of white wine. I also give this pasta dish another layer of flavor by adding a small can of cooked salmon. A bag of frozen peas are easily found on sale in the frozen deli case, for barely a dollar a bag. I got some mint from my patio garden -- it's a hearty herb that will take over your garden if you don't keep it pruned back. While mint is the namesake herb for this dish, you could substitute any fresh or dried herb you have on hand. 1 small can (about 7 ounces) of salmon - Okay to use salmon in a pouch, or substitute with canned tuna. 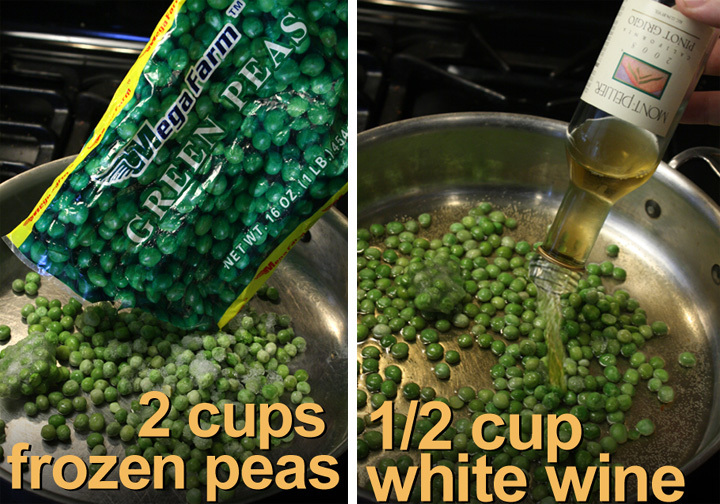 2-3 cups frozen peas - canned peas would be too mushy, but in a pinch, you could drain and use them. Handful of mint leaves (a dozen or so leaves) - okay to substitute with a favorite fresh herb. 1/2 cup of white wine - or pasta water. Or, substitute with broth. 2 tablespoons of olive oil - or any flavorful oil. 3/4 package of pasta (8 ounces) - I used fusilla, but you can use any pasta you have on hand. Follow package directions. 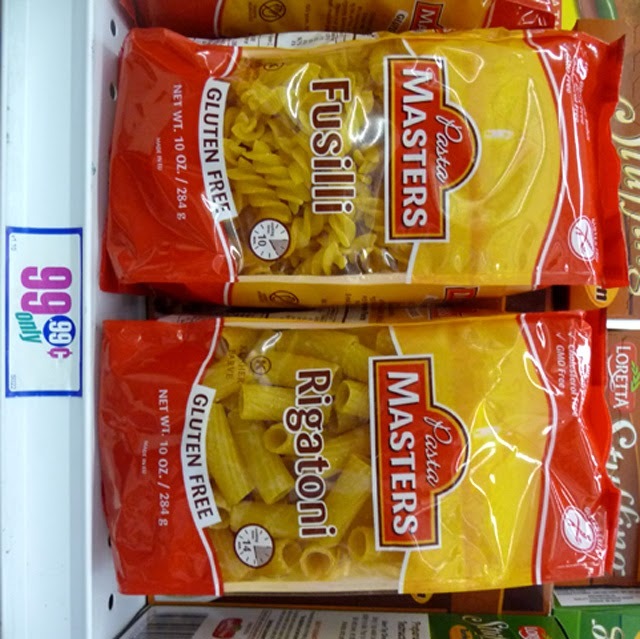 Start water for pasta and prepare pasta according to package direction. I usually shave off a minute or two from cooking time for pasta al dente. Over a medium heat, add frozen peas to a large pan, or pot. Pour in a 1/2 cup of wine or pasta water. Bring liquid to a simmer, then lower heat. Cover and steam peas until tender, about 5 minutes. Be sure to try a pea to make sure it is tender enough. Add liquid as needed if it steams away. 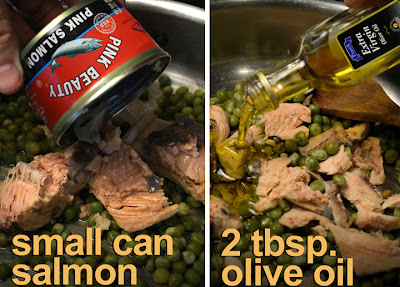 Drain a small can of salmon and mix into peas. Some canned salmon comes with a center line of bones, but I've found that they are soft enough to eat, but you can remove any bones you find. Lightly flake salmon into medium sized chunks. Turn up the heat and warm salmon. 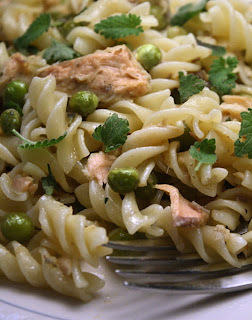 Drizzle 2 tablespoons of olive oil over the salmon and peas. Salt and pepper to taste. Mix in pasta, and heat through for a couple more minutes. Finish by sprinkling in chopped (or small leaves) of mint. 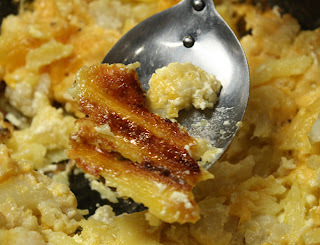 You can also top with Parmesan cheese. Serve this pasta dish hot, or at room temperature. 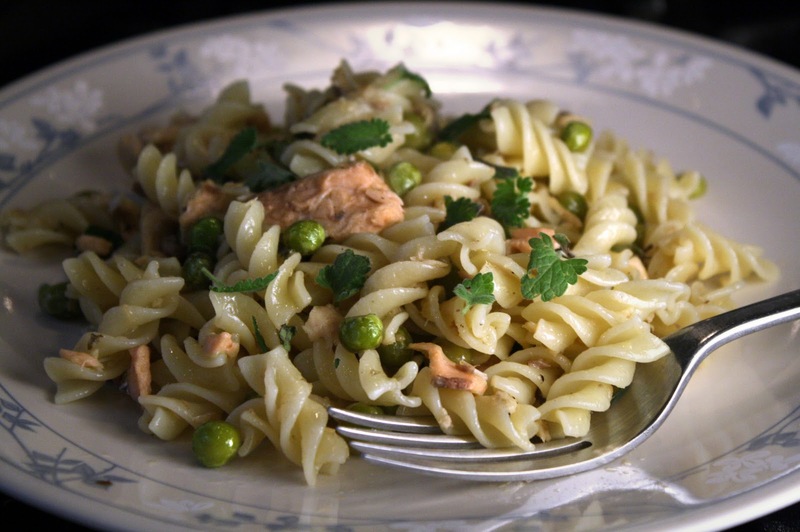 I originally made the pasta dish with 2 cups of peas, but I thought more peas would be better, so I upped the amount in my directions -- especially needed, if you go ahead and use the whole package of pasta. I also would add more olive oil, about a 1/4 cup total. I always think most recipes are too conservative with it, in these times of belt-tightening. And finally, you cannot have too much mint -- if you have it, then add a few more leaves!